After 28 years of teaching French in Elementary School, Beth has graduated to a life of learning and teaching from another vantage point. She loves sharing awesome things (puppy kisses, Voxx socks, great recipes, LOVE) , entertaining friends and family, running with the dogs, and generally serving others. She is not fond of doing dishes, and cold weather, although the warm water to do dishes helps her cold hands. At 51 she is ready to take on new challenges and share her secrets to resiliency. Helen Keller's quote "Life is either daring adventure or nothing." is her motto. Danny is skilled in many ways that allow this journey to be more comfortable for all, especially the Admiral. His ability to trouble shoot and fix the mechanics of the engines and systems as well as do fiberglass repair and general MacGyver type stuff means that he can do most of the work himself saving us the stress of finding a repair guy. He is also a competent captain who can navigate in ocean, lake, and coastal waters with ease. The Admiral is learning from him but still prefers that he is at the helm in rough waters. Danny is also a very social guy who loves to tell his own stories, drink beer and meet new friends. He loves his Traeger smoker barbecue and enjoys sharing the yummy things he creates on it. Rusty is an eight year old red Siberian Husky who rescued us from a sedate life. He loves to run and play but will also spend hours lying in the sun on the bow. He has enjoyed pulling sled, scooter and bike but is also content lying on the floor beside the bed. He is not fond of the sound of the engines so can be found on the fly bridge or the bow when they are running. He is friendly and knows just how stunning he is. 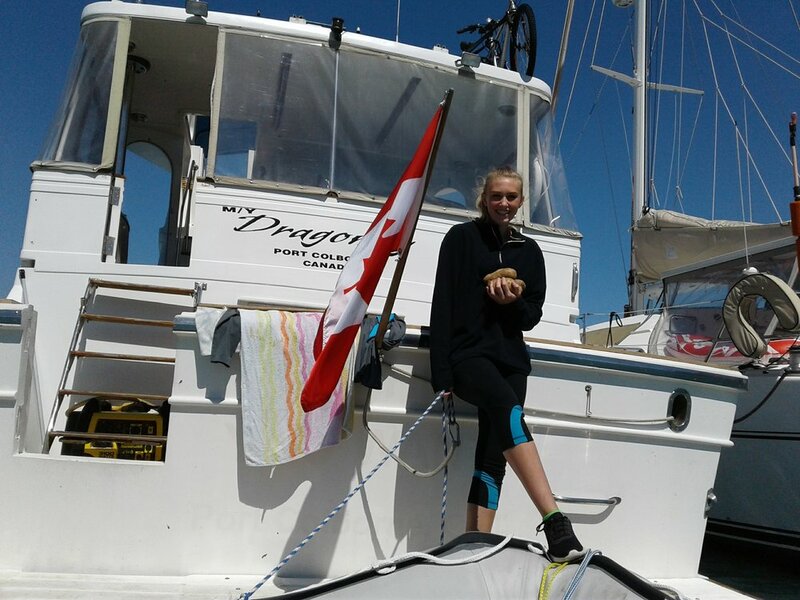 At 14, Alyssa is competent with lines, fenders, anchoring, and at the helm of both the dinghy and the big boat. She has chosen to stay on land this trip to be a "normal" grade 9 student after experiencing home/boat schooling last year. She loves music, especially 21 pilots, drama, her puppies, and math. She is not fond of doing dishes or physical education. She will visit when she can. 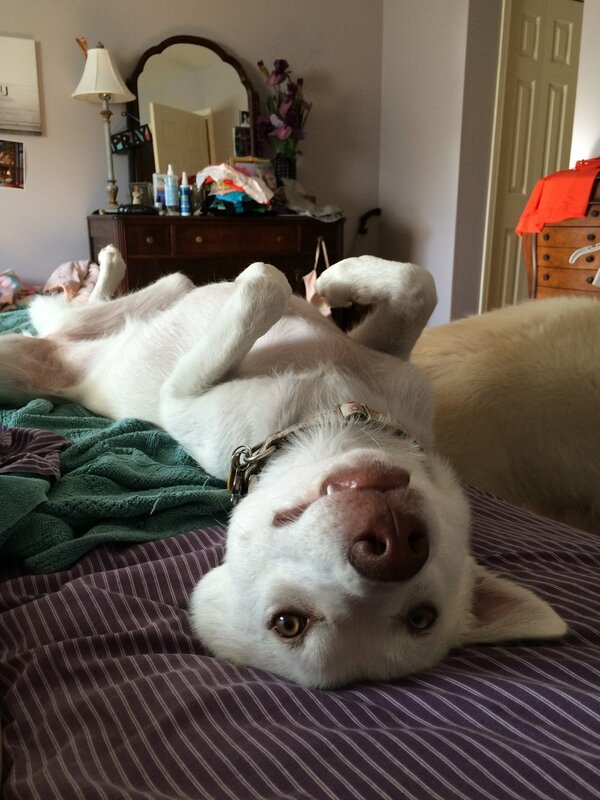 Lyric is a three year old teen-aged husky/white shepherd (we think). She is playful and energetic with the silliness of the teenager she is. When excited she will bark and loves to run. She is doing better at recall and is a great snuggler. She loves her mom and can be a challenge for Dad to take out. She is not fond of rough water.